Episode 1 of Youjo Senki introduced us of Tanya the Evil through the eyes of Viktoriya Serebryakov. We saw her battle prowess as a hardened Lieutenant for the country of the Fatherland, and we also saw her ruthlessness in terms of management and her drive to do whatever is most in line with efficiency for her country. 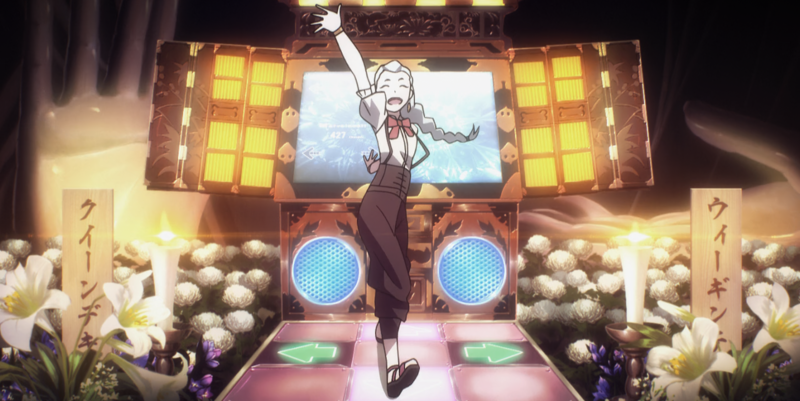 However, we had no idea how Tanya got to this point, and the mysterious backstory of Tanya as a reincarnated salaryman was only briefly touched on. All in all, while the episode itself was solid in terms of hooking me into the show, it didn’t give us a strong frame of reference to base anything off of. In the first post in this series, Owningmatt mentioned that “The underlying issue with this episode’s focus on characterization [. . .] is the massive amount of exposition being done about various events taking place in the setting, yet none of it really seems to explain the details needed for the viewer to really grasp the workings of the world itself.” This is a fairly unsavory issue for a first episode to have, to be sure – an unsteady flow of ideas and information about a series and the world that it attempts to build can be greatly detrimental to grabbing and holding the attention of viewers. Although this is the case for the series premiere, episode 2 of Youjo Senki corrects this janky world-building with a far more in-depth history of Tanya’s time before and after her transportation to this new world. And there aren’t any vague, unhelpful maps, either. To put this episode’s revelations in brief, we learn that Tanya was initially a ruthless salaryman in 2013 AD from our world. In this position, she was strongly concerned with and governed by rules, especially within her workplace. This adherence to the rules and the ruthlessness by which she enforced them indirectly lead her her untimely demise, being pushed into the path of an oncoming train by an employee she had laid off earlier that day. After a brief encounter with God (or Being X, as she calls it), Tanya was reincarnated as the show’s titular young girl into a world where she would, as Being X puts it, be put in “dire straits” and not have the modern technological conveniences of the current world. But definitely not actually Germany, of course. Didn’t you read the disclaimer in last episode’s end card? It’s particularly interesting to see how Tanya transitions from Japanese salaryman to fantasy German orphan girl, particularly because the regular rules of reincarnation don’t seem to apply to her experience with it. From the time that Tanya awakens as an infant, she retains everything she had known from her previous life, including enough to note that the world she finds herself in is an alternate version of Germany from our world (though she doesn’t say this quite as directly). Being thrust into some kind of alternate world is not an entirely uncommon premise for anime these days, what with the industry’s preoccupation with isekai stories of varying kinds, but generally speaking, many of these series end up being of the sword-and-sorcery variety, not World War 1.5 Mashup flavor. In considering this, Tanya has no MMO savvy to glean information from for surviving in this world. Instead, Tanya’s adaptability in this new world comes from an unexpected and fascinating place – her great preoccupation with rules. To quote her, in the brief “present day” segment we receive, Tanya notes that “a system requires rules to function smoothly,” and indeed, this is a philosophy that she follows, both as a salaryman and as a lieutenant for the Fatherland. As a salaryman, she had no qualms about laying off unproductive workers, regardless of the reasons for their various acts of insubordination or non-productivity. In perhaps a more brutal sense, she is not bothered in the slightest by choosing to place her two insubordinate soldiers in a rearguard pillbox which she knows will be an easy target for the enemy artillery units. In both of these situations, the underlying motivation for Tanya’s actions is because the parties in questions bend or disregard the rules of the systems they are a part of, and to Tanya, those systems cannot run smoothly unless the rules are strictly followed. And discipline definitely includes threatening to carve the rules onto the inside of a recruit’s skull. Textbook stuff. All part of the job, Tanya. Granted, this is a lot of information that we get in a fairly short amount of time in this episode. The first six minutes give us our brief glimpse into the life that was of Tanya the Salaryman, and we then pass through fourteen years of Tanya’s new life, including her rebirth, her life as an orphan, her development of magic, her induction into the Fatherland’s military, and her rising through the ranks of the military, in the span of the next five minutes. From there on, we see her first major military exercise (which was, in my opinion, a much more exciting display of the world’s magical warfare than we were shown in episode 1), for which she earns the Silver Wings Assault Badge, cementing her status as an ace in the military. What differentiates this from the confusion of the first episode is that Tanya guides us through the episode, and through her, we actually have a point of reference through which we can better understand the events that unfold. Instead of relying on what amounts to talking heads giving us infodumps for half of an episode, we are instead given a point of view and explanations from someone that shares with us the experience of being a resident of modern-day earth. Through Tanya, at the very least we understand the socioeconomic issues plaguing her new nation, and how this informs and affects how the ensuing war unfolds. As she guides us through her history and her early journey through this new world, it always feels as though we are given some sort of perspective that allows us to make more sense of the shifting world that Tanya has found herself in. Case in point: this changed pretty quickly. Even though there are still numerous questions circling about this new world – Who are the other nations, really? How do they treat their populace? Are they “bad guys?” What are the major motivations for the war? What changed to make Tanya invoke the name of God through her magic in the first episode if she claims to not believe in God in the outset of her life in the new world? – this episode has at least helped make more sense of Tanya as a character, and gives us a slightly more informed perspective on her new world. If Tanya continues to follow her zealous enforcement of the rules, we’ll find out the answers to these, along with what will likely be many other troubling questions, as well. For example: Does Tanya get adopted by foster parents? Spoiler alert: no.